Are faster Android software updates enough to tempt you away from the likes of Huawei and Samsung? Believe it or not, Nokia-branded phones are still alive and kicking in 2018. Built and designed by Finnish firm HMD Global, these handsets are designed to bundle high-end specs into an affordable, attractive package. The Nokia 7.1 – the newest addition to the line-up, and available to pre-order now – hopes to tempt customers with its iPhone X-style notched design, dual-camera system for bokeh portrait shots, and an unadulterated Android OS. The Nokia 7.1 is ostensibly a mid-range smartphone, although HMD Global executives branded it an "affordable flagship" during the announcement this week. And why shouldn't they? After all, the Nokia 7.1 has a number of the same features you'll find in the latest and greatest from the likes of Huawei, Samsung and OnePlus. Notch in the display? Check. Fast charging? Check. Dual-camera for blurred backgrounds in your portrait shots? Check. HDR display? Check. It's an impressive list of features, especially given the Nokia 7.1's £299 asking price. In the hand, the Nokia 7.1 feels surprisingly solid, too. The 'dual-anodised diamond-cut coloured edges', which we assume is marketing bumf for 'shiny and metallic', help to give the Nokia 7.1 a heft not always associated with phones at this price. Make no mistake, though, you're not going to accidentally mix-up phones and pocket your friend's Nokia 7.1 instead of your iPhone XS. It doesn't feel that premium. Under the bonnet is a Qualcomm Snapdragon 636 chipset, coupled with 3GB of RAM. Nokia will be selling 32GB and 64GB storage models, both of which can be expanded via microSD. There's also a 3,060mAh battery with support for fast charging via USB-C. If you're in a hurry, the 18W charger included in the box promises to top-up 50% of your battery in half an hour or so. Unfortunately, those looking for wireless charging won't find it here – despite the Nokia 7.1 sporting a glass back. Aside from the new design, the biggest bet for HMD Global is Android One, which means you're guaranteed monthly security updates and patches direct from Google. Android One should result in better security for your handset, since the software updates aren't held-up while the phone manufacturer adds their own tweaks. Nokia 7.1 will also benefit from free, unlimited Google Photos storage. Despite all this Google-goodness, the newest Nokia smartphone doesn't ship with Android 9.0 Pie, which launched in early August, out of the box. Nokia is already rolling-out the major mobile OS update to other handsets in its line-up and promises the update is coming very soon to the Nokia 7.1 – but for a phone that's supposed to be so tightly linked with Google, it seems like a weird oversight. Android Pie brings a number of improvements, including Adaptive Battery and Adaptive Brightness, which adapt to how you use your phone, learning your preferences to anticipate your adjustments to make the handset more efficient. Both of these manufacturers are well-known for dragging their feet when it comes to pushing out the latest Android OS upgrades to their older handsets. Huawei and Samsung both ship smartphones with heavily-customised versions of Android. This means they include some useful, not-seen-anywhere-else features (Samsung had split-screen apps long before Google, for example) but it can slow the roll-out of hotly-anticipated features, like Adaptive Battery. Nokia is betting that you'll prefer the same unadulterated version of Android that ships on the Google Pixel range. And we're tempted to agree. 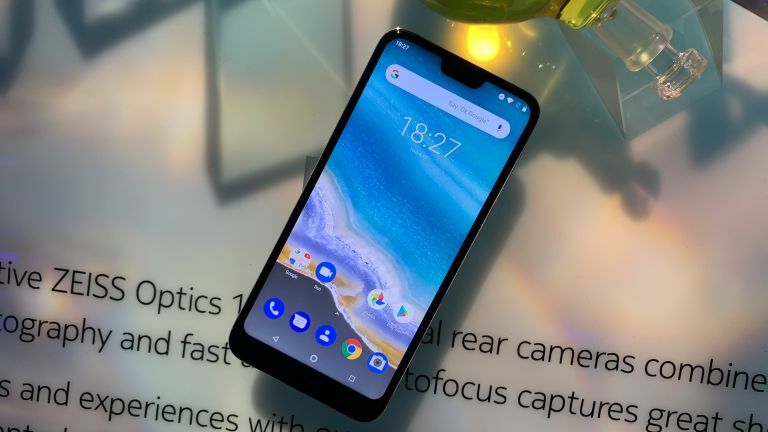 It's worth noting that the Finnish firm is not the only manufacturer betting customers will prioritise faster security patches and new software upgrades, with Motorola also recently a slew of similarly-priced Android One handset, the Motorola One. On the back of the Nokia 7.1 is a dual-camera system that combines a 12-megapixel and a 5-megapixel sensor. These work together to add artificial bokeh blur behind the subjects of portrait-style photographs. Nokia says the dual-lens set-up should produce better, more accurate low light shots thanks to the improved HDR capabilities. Unfortunately, we weren't able to vouch for this during our brief time with the device. On the front of the Nokia 7.1 is an 8-megapixel for selfies and video calls. Nokia is still pushing its "Bothie" feature that stitches together images taken simultaneously from the front-facing and rear-mounted camera. Ever wanted to take a shot of your friends at a gig, while also capturing the performance you're watching? No, us neither. • Pre-orders for the Nokia 7.1 start today, October 5, in the UK and Europe. The first orders should land with customers on October 18, 2018. • Prices start from £299 in the UK, while European customers will have to spend in the region of €299 to €349 depending on their region.